CARGO had himself quite the day at Wrigley Field – doing yard work at the dish twice. While his career home and away splits favor his Coors Field Play (.348/.409/1.041 – Coors Field Career), his 2013 numbers look better on the road OPS of 1.063 to .858 thus far. Gonzalez is leading the NL with Runs Scored this year. It still must be noted that 4 of his Road HRs have come in hitter friendly Miller Park and Wrigley Field. Wait to see what the Averages are at the end of the year. Has he matured as a hitter – or is this just a small sample size? Adrian Beltre has really started to heat up – having hit for HRs in 3 out of the last 4 games – and driving 9 RBI in his last 8 games, with a .387 BA. Moreland has hit 3 HRs in his last 2 Games – and has clubbed 6 Taters in his last 9 contests. 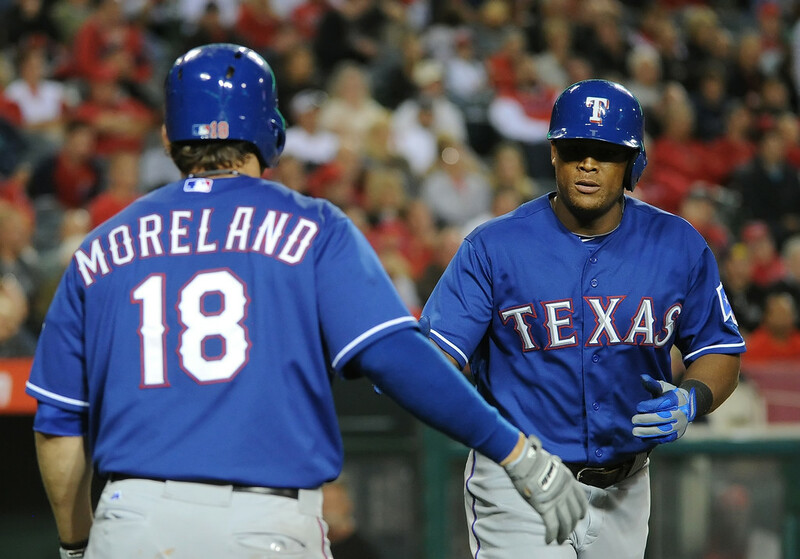 Both men are tied with teammate Nelson Cruz for the club lead at 9 (good to be tied for 5th In the American League). The Rangers have parlayed these hot streaks into the being tied for the top record in the AL at 25 -14, (tied with the Yankees) and have a 6 Game Lead on the 2nd place holders of the AL West (Oakland Athletics). Despite what happened at the end of 2012, it looks pretty good for the Rangers to lock down a playoff spot this year because of the weaker Division. Pablo Sandoval hit a HR for the third straight game – while Brandon Belt hit a HR for the 2nd game in a row. Mitch Moreland hit 2 HRs last night, has homered in 2 straight – and is one of 11 guys tied for the 5th spot in the AL HR King. Adrian Beltre hit a HR to enter the top 5 AL Batters. Carlos Beltran hit a HR to tie 3 other players for 2nd – 3 longballs behind the NL leader Justin Upton. Carlos Gonzalez had a Multi HR game yesterday – as part of hi 5 – 5 game at Wrigley Field. 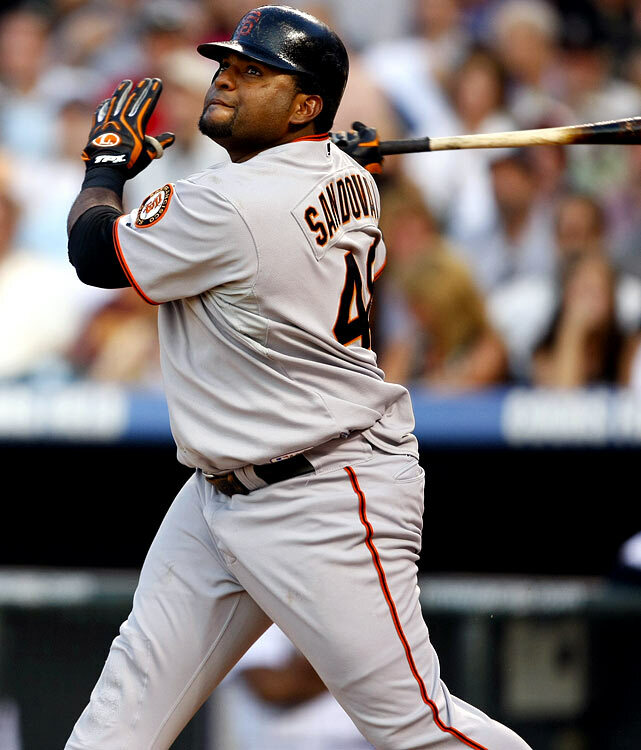 Pablo Sandoval has hit a HR in 3 straight games for the Giants. Listed on baseballreference.com at 240 LBS (yeah – right, more like 270) has not slowed down his bat speed. He enters today’s game with a 3 Slash Line of .316/.358/.851. He also has only fanned 16 times in 38 Games and 165 Plate Appearances. It is nice to see you can have a guy hit for power without Striking Out 150 times a year. Sandoval has 7 HRs and 29 RBI (6th in the NL) so far this year. Posted on May 15, 2013, in The Rest: Everything Baseball and tagged adam dunn, albert pujols, Andrew McCutchen, billy butler, brandon belt, bryce harper, carlos beltran, carlos quentin, chase field, chicago cubs, chris carter, chris davis, Chuck Booth, colorado rockies, Coors Field, Darwin Barney, david ortiz, dayan viciedo, Domonic Brown, edwin encarnacion, eric young jr., evan longoria, howie kendrick, j.p. arencibia, jean segura, john buck, jon jay, josh hamilton, justin upton, kevin frandsen, la angels, mark reynolds, mark trumbo, marlon byrd, miguel cabrera, Mike Morse, Mike Trout, mitch moreland, nelson cruz, new york yankees, oakland athletics, pablo sandoval, paul goldschmidt, prince fielder, raul ibanez, robinson cano, ryan flaherty, san francisco giants, st louis cardinals, texas rangers, top 5 HR Leaders AL and NL, Top HR leaders in the MLB, twitter @chuckbooth3024, vernon wells, wrigley field. Bookmark the permalink. Leave a comment.